Stock Market is one of the most preferred investment options for almost everyone. One can earn a lot of money from the stock market. However, before entering the stock market it is highly recommended to learn stock market investing. You can always learn stock market investing by reading the best stock market books. Alternatively, you can also learn from stock market experts or successful stock market investors. Here is a list of 10 individuals who have made it large on the stock market. Rakesh Jhunjhunwala is Investor with Midas touch. A Big Bull Rakesh Jhunjhunwala is also known as Warren Buffett of India. He is a most popular stock market investor in India. Rakesh Jhunjhunwala is a common man with uncommon intelligence. Making money from the stock market is like child’s play for Jhunjhunwala. Rakesh Jhunjhunwala is qualified charted accountant and stock market Investor. He manages his own stock portfolio as a partner in the asset management firm, Rare Enterprise. He created a wealth of 3 Billion USD from the stock market. Learning from Rakesh Jhunjhunwala is given below. As per Rakesh Jhunjhunwala, one needs to find out stock with lower valuation and good future business potential. It is a difficult task but with fundamental analysis and deep understanding, one can master in this task. Long-term investment in a good stock is a key to generate wealth from the stock market. You must be surprised to notice that Rakesh Jhunjhunwala is holding many stocks in his portfolio for long. As per him you need not sell the stock if fundamental of the company is good. Controlling emotion and keeping patience is extremely important in the stock market. The stock market moves upward as well as downwards. During downtrend or during market crash one should maintain patience. In another word, one should have faith in investment made in stocks. Radhakishan Damani is also known as Mr. White and White. RKD (Radhakishan Damani) is a master in picking a multibagger stock. R K Damani is mentor and Guru of Rakesh Jhunjhunwala. Radhakishan Damani has earned a lot of money from the stock market investment. Learning from R K Damani is given below. Looking at a portfolio of R K Damani it can be clearly said that small-cap and mid-cap stocks are must for a portfolio. Mid Cap and Small Cap stocks have huge upside potential for future. Long-Term Investment is second learning from R K Damani. He is holding many stocks since long-term and he advises to do so. It is proved by R K Damani that business and the stock market is a great combination to earn a lot of money. He created massive wealth from a combination of business D-mart and the stock market. 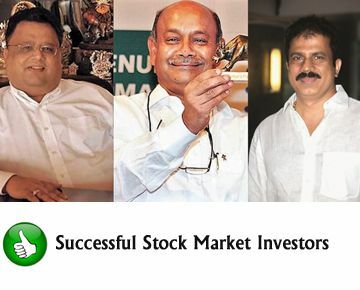 Porinju Veliyath is one of the most successful stock market investors of India. He has made his own fortune in the Indian stock market. The success story of Porinju Veliyath is quite interesting. From a homeless person, he has become one of the most respected value stock pickers of India. Learning from Porinju Valiyath is given below. Porinju Veliyath Follows simple strategy for earning money from the stock market. He identifies and invests in future multibagger stocks. Porinju believes in less – known, high-quality business. His advice is to invest in high-quality business to generate maximum portfolio value. Porinju always invests in companies with a clean balance sheet, honest management, and good business potential. Rajiv Khanna and Dolly Khanna are most successful stock market investors of Dalal Street. This couple has an incredible ability to identify multi-bagger stocks for investment. They have generated a lot of wealth from the stock market. Dolly Khanna is a homemaker. Her investment portfolio is taken care by her husband Rajiv Khanna. This couple is famous for identifying multibagger stocks. Few mutlibagger stocks identified by them are Nilkamal, RS Software, Liberty Shoes and Cera Sanitaryware. The current portfolio of Dolly Khanna is worth 200 Cr. Learning from Dolly Khanna are given below. One should invest based on fundamentals. This simple concept is adopted by this couple in most of the cases. They believe in doing fundamental analysis of the stock. If fundamentals are strong, a stock is more likely to become multibagger. It is also called as a thoughtful investment. Invest in a Small cap or mid cap stock which has the capability to become large cap. Dolly Khanna and Rajiv Khanna invest only in Small Cap and Mid Cap stocks. As per them a chance of finding multibagger in Mid Cap and Small Cap stock is very high. Dolly Khanna and Rajiv Khanna style says that one should invest in consumption-based stocks. They mostly invest in consumption-based stocks like a home appliance, cooker, cement, plastic, paper etc. All these companies deal with a middle-class product where the demand for the product is likely to be very high. Vijay Kedia is one of the most successful stock market investor in India. He has made wealth of 200 Cr from stock market starting from Rs.35000. Vijay Kedia is a common man with an uncommon intelligence. His stock market strategy and investment style is followed by many investors blindly. He is an inspiration for many investors who are seeking success from the stock market. A stock market lessons learned from Vijay Kedia are given below. Vijay Kedia advised investor to develop risk taking capacity. Stock market investment is risky affair. One can generate lot of money or can lose entire capital. One should have good risk taking capacity. One should control emotion and keep patience. It is extremely important quality for stock market investing. If stock is good one should be able to hold the stock irrespective of stock market conditions. Raamdeo Agrawal is a distinguished stock market investor who made stock market fortune of 1000 Cr starting from zero. Raamdeo Agrawal is known as value investor. He does lot of research before investing in stock. He has inherent skill to identify mutlibagger stocks. He inspires a lot from investment style and strategies. As per Raamdeo Agrawal, Investor should look at longevity of the business. How long business growth story will continue? Predicting longevity is a pure judgment based on experience. This gives confidence of investing in stock. Raamdeo Agrawal also recommends investing in company after careful evaluation of cash flow statement. A company should able to generate positive cash flow. Good cash flow indicates company is profitable. One can invest in company with healthy cash flow statement. Do you follow stock market strategy and advice from successful stock market investors?